The Wiener Werkstätte was founded in Vienna in 1903 by architect Josef Hoffman and artist Koloman Moser. An association of design workshops, it is comparable to the British Arts and Crafts movement led by William Morris. The Wiener Werkstätte prioritised the aesthetic experience and handmade objects. They sought to bring great design into everyday life, producing textiles, metalwork, glasswork, jewellery, ceramics, books, furniture and postcards. Mela Koehler (1885-1960) was one of a number of artists producing illustrations for these postcards. Koehler studied in the School of Applied Arts in Vienna, before becoming involved with the Wiener Werkstätte and the Wiener Frauenkurst, an association for female artists and craftswomen. Her postcards fall into two broad categories – those celebrating holidays (such as Easter, the New Year and Christmas) and fashion postcards, which depict the popular styles and patterns of the day. 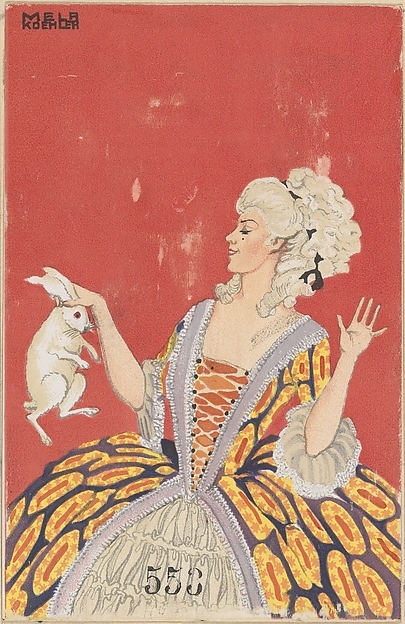 The vibrant patterns Koehler uses both in the costumes and the backgrounds of her postcards are very much of the Wiener Werkstätte style. In particular, these postcards can be seen to relate to debates about women’s dress in Europe at the turn of the twentieth century. Mary L. Wagener has written about the move away from restrictive corsets, as women sought more practical and comfortable clothes. However, in Vienna this had to be combined with their ‘international reputation for elegance and taste.’ Reform dress in Austria was popular for its new stylistic possibilities; rather than its advantages for women’s health as in the rational dress movement in Britain. Reform dress was slow to impact on everyday wear in Austria, with the exception of sportswear. Koehler designed a number of postcards showing women dressed for sports such as sledding, tennis, croquet and golf. The costumes she designed allowed women to be active, whilst remaining elegant. Designers also looked back to the Biedermeier period, particularly the dresses designed for the Viennese waltz, as ease of movement was important in the new reform dress style. Koehler created a series of postcards of dancing couples which reflect this influence. 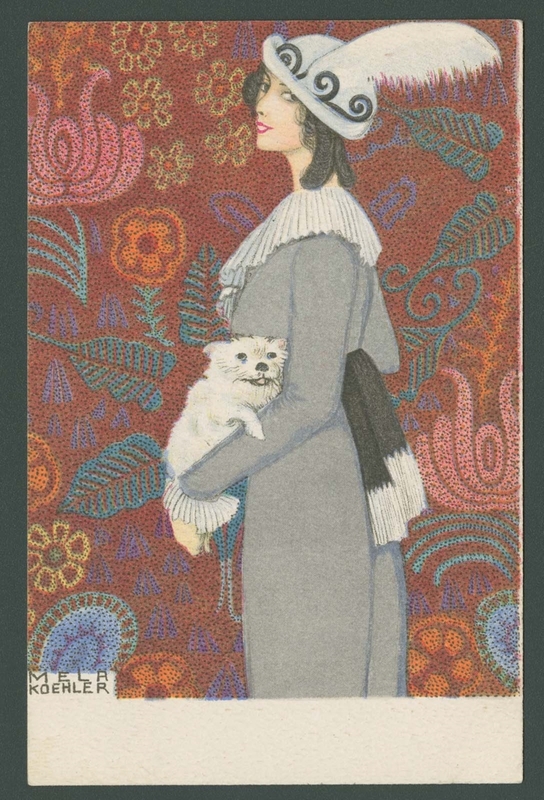 Many members of the Wiener Werkstätte, including Koehler and Gustav Klimt (1862-1918), designed textiles and clothing. Koehler’s postcards show how these new garments could be both functional and aesthetically pleasing. 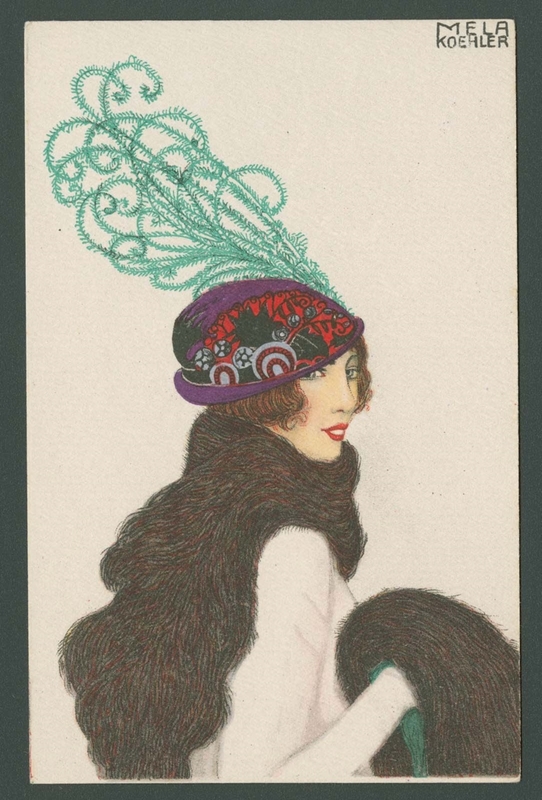 Her elaborate headdresses (including a postcard series on hats) encouraged experimentation with fashion. Koehler’s imaginative designs impacted on Austrian fashion, and formed a significant part of the visual culture of early twentieth century Vienna.